Thrilling anticipation every time when Terrence Dixon announces new releases, which are rarely disappointing by the artist I’m keenly following. While not seeking broad publicity, Dixon is among Detroit producers of trust and has got talent to provide techno masterpieces. Introducing Chronicle, a new sub-unit of the US label Thema, Dixon has dropped again an exceptional release, this time under the Population One moniker. Right from the start he follows the standards set in Population One’s groundbreaking 1995 release “Minimalism” on Utensil. Built on hollow bass drum, hiss and crackles, “Transition” is destined for drifting in Jupiter’s magnetosphere and sending transmissions to distant nebulae. Taking off to interplanetary journey, 909 showdown in “Relay” belongs to the same league with Jeff Mills’ recent output, like “Something In The Sky” series. Further feeding alien imagination, blurred oscillations of the B1 track “Approaching” see a space station docking amidst meteor shower. Functional fare fills the rest of the B-side, with loop-driven solid workout “Escape” and “Thinking” in the same rhythmic vein. Although Dixon has actually never been away, with “The Return” he presumably updates his status as techno producer of choice. The EP is a strong manifest of his and Detroit’s abilities and essential techno release for 2012. 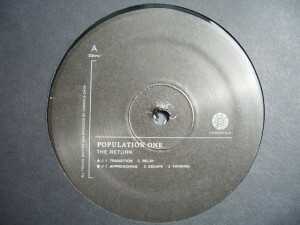 Just a footnote: When speaking about true reduced techno, then two producers have been leading the way: While Dan Bell AKA DBX has represented jacking and funkier side, Dixon has produced smudged sci-fi textures, but both of them have played a pivotal role in the evolution of minimalistic sounds.